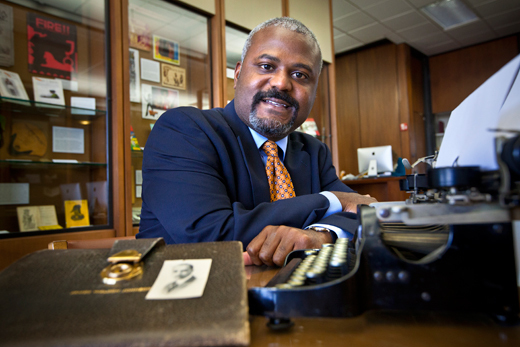 Emory sociology professor Tyrone Forman, has been appointed director of the James Weldon Johnson Institute for the Study of Race and Difference. Emory Photo/Video. Emory University's James Weldon Johnson Institute for the Study of Race and Difference (JWJI) has appointed Emory sociology professor Tyrone Forman, a renowned scholar of social change, race and ethnic relations, as its new director. Forman is leading the institute's work to build the JWJI as a national destination for interdisciplinary public scholarship and teaching on all aspects of modern civil rights, race and difference. Forman's appointment completes the merger begun last year of the original JWJI and the university's Race and Difference Strategic Initiative, and sets the stage for an expansion of the institute's original vision, including a deepening of rigorous scholarly exploration combined with a broadening of public scholarship that engages the Emory community, Atlanta and beyond. Forman formerly co-directed the race and difference initiative. "I am thrilled that Tyrone Forman has agreed to serve as the director of the James Weldon Johnson Institute for Race and Difference. He is an accomplished sociologist, whose work on race, social conditions and opportunity speaks to the core of the Institute's mission. I am confident that under his leadership we will see the flourishing of new initiatives, partnerships and research. We are fortunate that he has agreed to accept this appointment at this critical stage," says Emory Provost Earl Lewis. Forman replaces the late professor Rudolph P. Byrd, who founded the institute in 2007, and quickly built it into a national hub of modern civil rights scholarship. Byrd, the Goodrich C. White Professor of American Studies and a renowned scholar of African American literature and culture, died in October 2011 after a long illness. One major initiative of the JWJI will be the Atlanta Area Study (AAS), a multi-disciplinary, collaborative initiative that seeks to strengthen research, teaching, and public decision-making related to race, difference and public policy. The present-day metro-Atlanta area, combined with its rich history, creates a complex case study for such scholarship and teaching, Forman says. AAS will involve the collection of high quality social science data in the Atlanta metropolitan area that attempts to answer basic scholarly questions in the field of race and difference. The work also will help expand the scope and quality of undergraduate and graduate student research training in the social sciences and allied professional fields at Emory. Forman says a major goal of the work is to get the findings of the scholarship and research to the public and policy makers where it can make a difference. "We want to build on the great foundation of the JWJI to establish a nationally recognized research program on race and difference in the Atlanta metro area that will illuminate pressing local and national-level social issues," Forman says. "In turn, we will work to share that research through community outreach to local citizens, policymakers, community-based leaders, corporate executives, and opinion leaders in the Atlanta metropolitan area." One avenue of outreach has been the popular CNN Dialogues, a partnership with CNN and the National Center for Civil and Human Rights that has provided community forums throughout Atlanta on a variety of social issues. The institute also will continue its signature Visiting Scholars program, sponsored by the Andrew W. Mellon Foundation. The program draws established and emerging civil rights and social justice scholars from around the country to Atlanta and Emory to teach and work on original research. Other signature programs include a working group of scholars funded by the Arcus Foundation who are exploring points of intersection between the civil rights and the black lesbian, gay, bisexual and transgendered movements. Through all these efforts Forman says he "hopes to make Emory the nation’s premier university for research, teaching and public dialogue on race and intersecting dimensions of human difference, whose members are nationally recognized for their collaborative work in making positive transformations in the local Atlanta community and world communities."